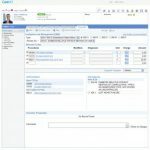 CureMD EMR Software is a market leader providing modern-day health information systems and services that enhance the clinical and administrative operations of healthcare practices and enterprises. The integrated cloud-based solution provides specialty Electronic Medical Records (EMR), Practice Management (PM), Patient Portal and iPhone/iPad app. The all-in-one solution simplifies decision making, streamlines operations and ensures fulfillment of all operations to deliver better care, patient safety and reduce costs for medical practices of all sizes. CCHIT certified for most comprehensive EMR software, CureMD is ISO 9001:2000 and ISO 270001:2005 certified for Quality Operations and Information Security respectively. CureMD is not only Meaningful use certified but also has Sure Scripts Gold Certificate for e-prescription. CureMD offers solutions for various specialties. 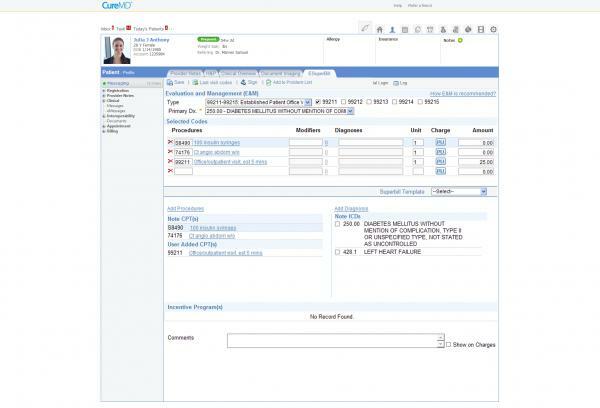 It includes specialty-specific content, customizable templates and customs forms designed to enhance clinical workflow and save time. 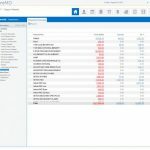 It comes with the point-and-click documentation capability and tools like ‘workflow editor’ to support a provider’s unique style of charting. The EHR offers utmost interoperability allowing care providers to exchange information across healthcare facilities and organizations. 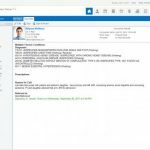 Some of the main features include document imaging (built-in PACS), clinical decision support, E&M coding, custom forms and clinical voice recognition for dictation. The ‘e-prescription’ feature connects prescribers to over 40,000 pharmacies across the U.S.
CureMD also has a dedicated application called “Avalon” for iPad and iPhone. Avalon allows doctors to view their appointments, patient’s records, medical histories, clinical reviews, patient notes, and insurance eligibility securely. Assisting providers to document while they are on the move. 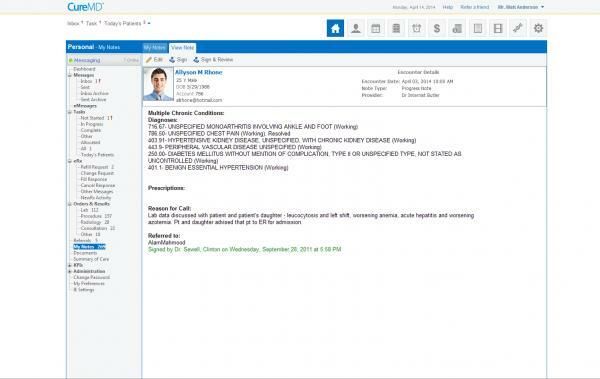 The integrated practice management software is HIPAA compliant and ICD-10 ready. 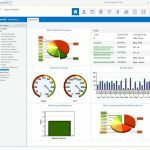 It streamlines administrative and financial operations by connecting the front and back office. 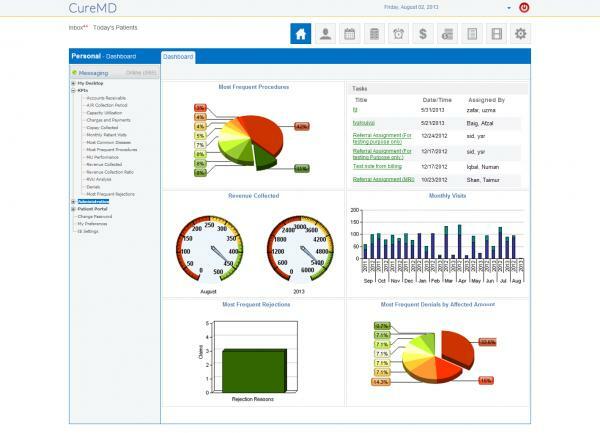 CureMD PM includes personalized dashboards that allow administrators to monitor on-going operations, review and assign tasks and gauge practice performance. The scheduler module simplifies appointments and resource allocation across multiple providers and locations. The PM module also offers intelligent billing features for the billing team, which include automatic charge capture, electronic claim submission, electronic payment posting, clean claim checks, denial management, and financial reporting. CureMD’s patient portal is a useful tool for patients to communicate with the clinic to manage appointments, refills, demographics, histories, and insurance. For physicians, the portal provides an easy manner of communication with their patients. CureMD also offers Medical Billing Services that caters to over 32 specialties and provide complete revenue cycle management to expedite reimbursements. 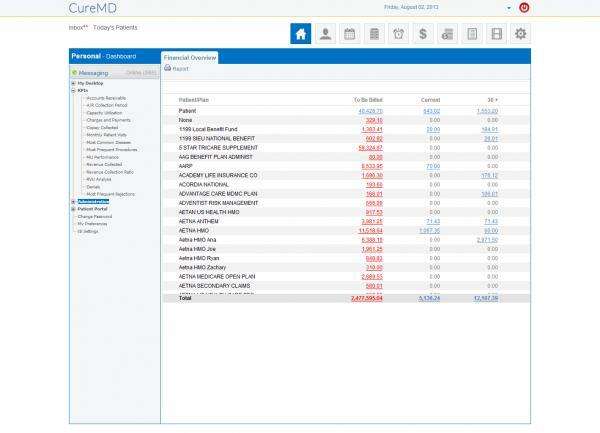 Pros: The system is very to use&comma; we used to use paper charts but we have switched to CureMD EHR software. Cons: The customer service people answer very late to the queries. Other than that everything is going great. Pros: It is very affordable. It is much more attentive to our needs than the previous contact. Cons: Good price but is not very user friendly. Only operates on Windows default browser. No split screen capabilities and takes ages to load even a single screen. Pros: Easy to use once the patient is registered into the system. The customer support people are great when you are trying to learn the system. The payment system is great. Cons: The patient charts need to be more customized. The interface of the system is pretty mainstream. Pros: Ease of completing progress notes. 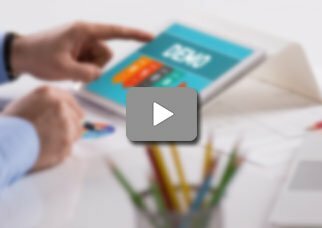 Really really easy referrals. The software offers easy accessibility. The interface is great and user friendly. Cons: The financial piece promised a lot more than it actually does. Customer support is weird. 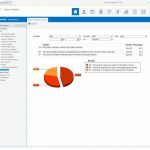 Pros: The software has great reporting capabilities. The system is very robust and CureMD does a good job of staying ahead of the game regarding new and future law/regulation/requirement changes. Cons: The medication section needs improvement. The documentation of data is time consuming which affects the ease of use. 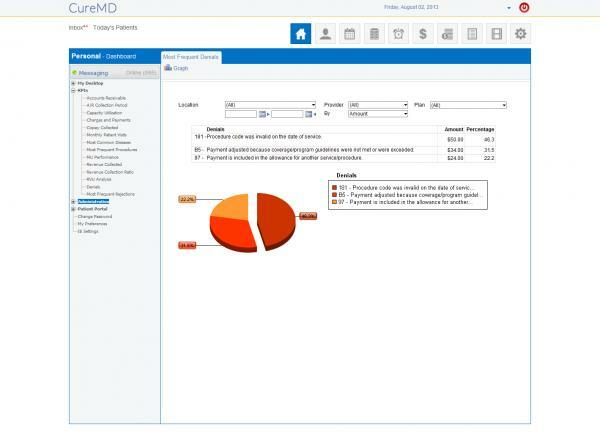 Verdict: CureMD is a Great EHR system! Pros: The software has made the everyday work in our practice very fast and efficient. It is very user friendly. Cons: There are some minor issues with the claims. Please work on it. Pros: There is nothing I like about this product. Worst experience ever. Cons: Extremely disorganized&comma; unprofessional and outdated software with a number of glitches. Verdict: Do not use this EHR for your medical practice.